When Nadia's family moves to Captive's Sound, she instantly realizes there's more to the place than meets the eye. Descended from witches, Nadia can sense that a spell has been cast over the tiny Rhode Island town—a sickness infecting everyone and everything in it. The magic at work is darker and more powerful than anything she's come across and has sunk its claws most deeply into Mateo . . . her rescuer, her friend, and the guy she yearns to get closer to even as he pushes her away. Mateo has lived in Captive's Sound his entire life, shadowed by small-town gossip and his family's tormented past. Every generation, the local legends say, one member of the family goes mad, claiming to know the future before descending into insanity. When the strange dreams Mateo has been having of rescuing a beautiful girl from a car accident actually come true, he knows he's doomed. Despite the forces pulling them apart, Nadia and Mateo must work together to break the chains of his terrible family curse, and to prevent a coming disaster that even now threatens the entire town, including Nadia's family, her newfound friends, and her own life. 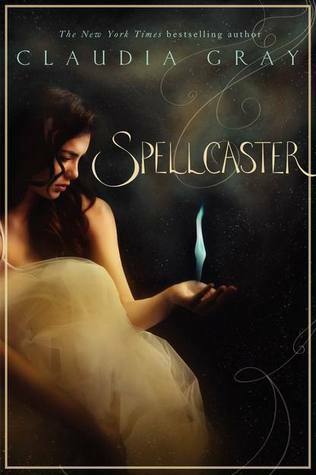 Shimmering with magic and mystery, New York Times bestselling author Claudia Gray's new novel depicts a dark and unforgettable world of witches, curses, buried secrets, and star-crossed romance. Gray was a new author to me, but I'd heard amazing things about her Evernight series, so my expectations were high. I was also completely drawn in by the absolutely stunning cover art! What I got was a book of magic and love with a twist of mystery. I tried to love this book. I really wanted to love this book. I just didn't. I loved her writing style and I found myself occasionally re-reading certain passages because the prose was just beautiful. Unfortunately, I didn't like the story very much. I think my biggest problem was that I couldn't connect to the characters... at all. I felt like they were flat. The POV kept switching between the three main characters (...and a bird's at one point), so that was a little disconcerting. That usually doesn't bother me, but in this book, it was jarring. As much as there was no connection between the book and I, I feel the same thing happened with the characters. Sometimes the relationships seemed forced. Elizabeth, the villain, should have been a formidable, scary entity, and unfortunately, I was just irritated with her. If I could have used one of their spells and popped her up out of my Kindle, I'd have taken my fingers and given her a good flick right out of the book. All that said, occasionally I'd come upon a part of the story that would grab me and I'd have to furiously flip pages until I found out what would happen. But, those were too few and far between in my opinion. The ending was absolutely spectacular. It was such a strong finish that I didn't see coming. This is the first book of a trilogy, so while this wasn't my favorite book, I wouldn't count it out yet. Stick around for what's to come. As I said, Gray's other works have made a huge impression, and even her writing in this book was beautiful, so we're quite possibly in for a big surprise.